① Three LCD combining design type to provide more display application. ② Black powder coated frame for a fashionable profile style. ③ Main for wall mounting advertising display. ④ High resolution screen to improve the image visual effects. ⑤ Wide view angle reach about 178° to attract more people from all sides. ⑥ Excellent playing hardware ensure the menu board outstanding performance. ⑦ All kinds of application such as fast food restaurant,hotel,shopping mall,market,exheibition room,etc. ① ADMW LCD Advertising Wall-mounted Super High Resolution Menu Board can be packed with corrugated box or honeycomb box according to different shipping needs. 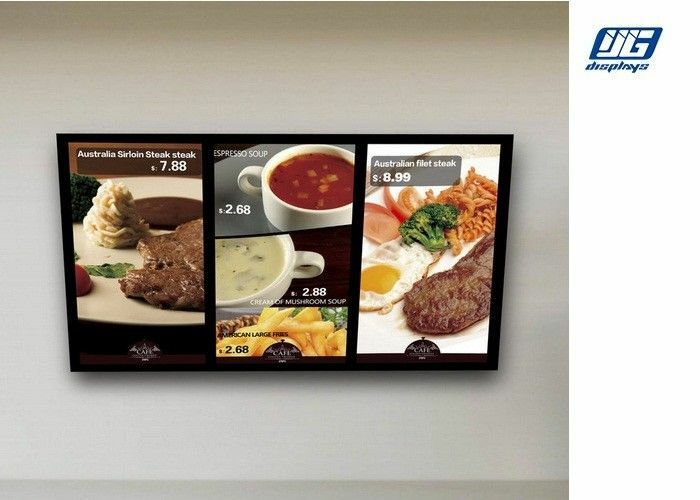 Over-10-year expericence are in accord with your assurance and recognition of our high quality ADMW LCD Advertising Wall-mounted Super High Resolution Menu Board.